All amounts are per weight. You will need to use a digital scale for these measurements. Makes approximately 44 oz. of soap. Note: Because this soap is highly superfatted it can create a very dense lather when rubbed directly on skin. For a light, bubbly effect I recommend lathering with a natural sponge like this one. 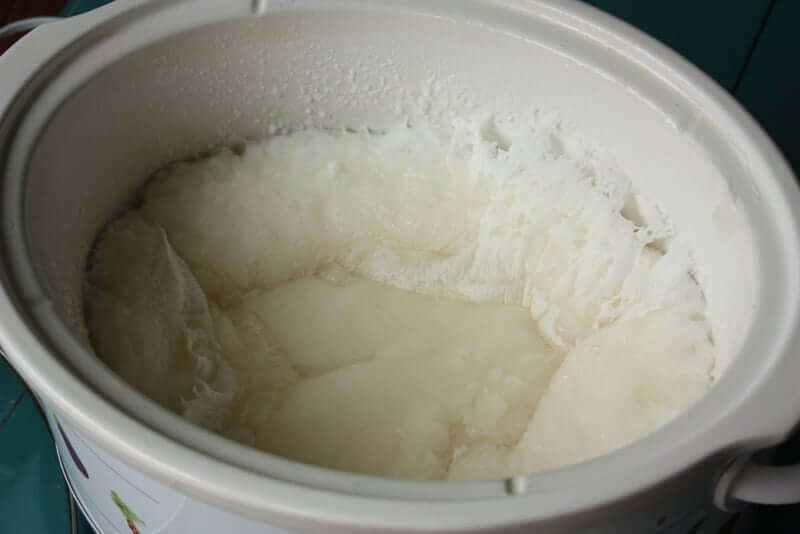 * For soap making purposes there are several types of coconut oil. The stuff I buy has a melting point of 76 degrees. 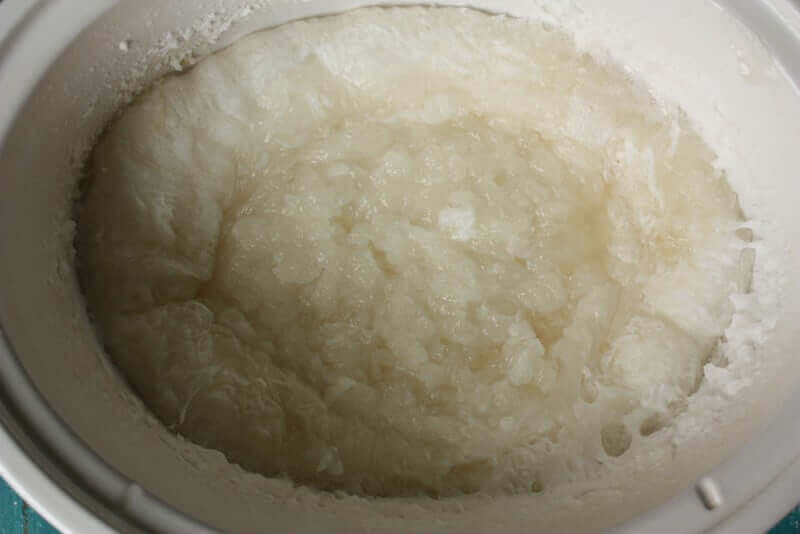 This is the most commonly available kind and the preferred type for soap making. 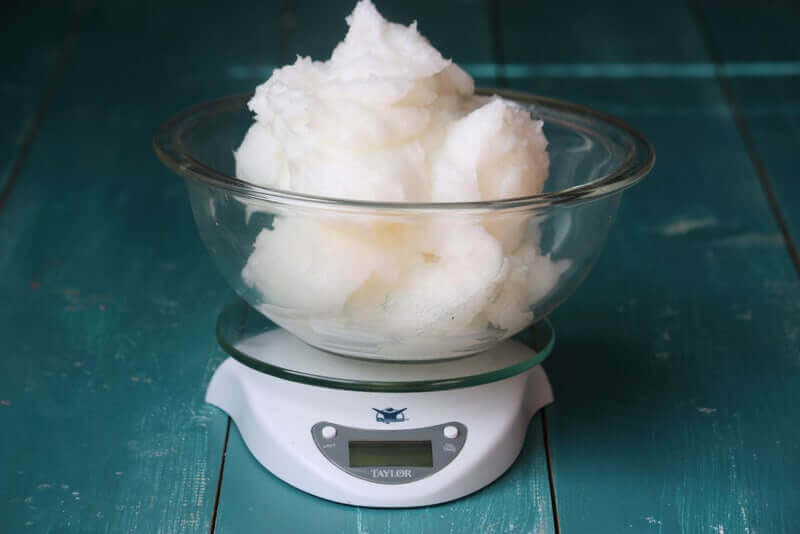 There is also a coconut oil that has a melting point of 92 degrees and another that is “fractionated,” meaning that the long chain triglycerides have been removed, leaving only saturated fats. I have not tested this recipe with either the 92 degree or fractionated oils, but it works well with the 76 degree type. ** You can often find pure lye with no additional plumbing/drain additives in the drain cleaner section of a mom n’ pop hardware store. Lye is a naturally occurring substance that can be made by burning hardwoods and boiling the ashes, but it’s much easier to just buy. If you don’t see it, ask a sales clerk for help. They may be keeping it behind the counter because it has multiple uses. Be prepared to explain that you want to make soap, not meth. ? 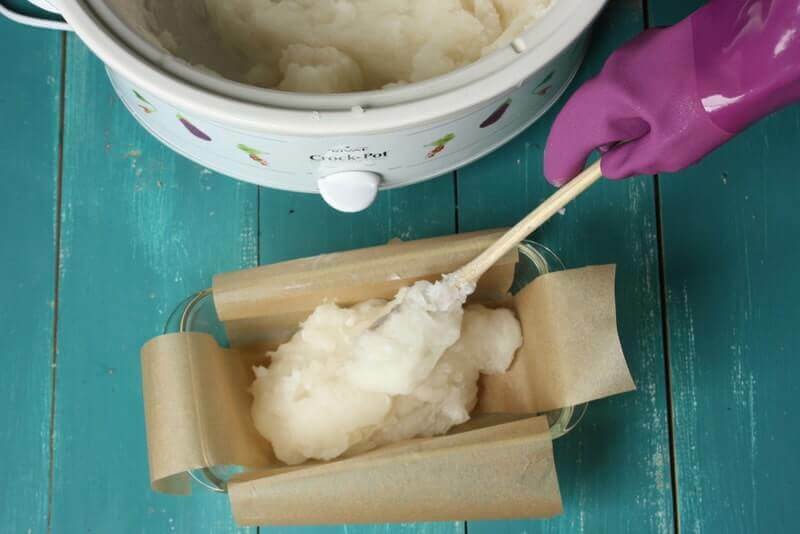 Note: According to Anne Watson, author of Smart Soapmaking, you can use your regular kitchen utensils as long as you follow these guidelines. 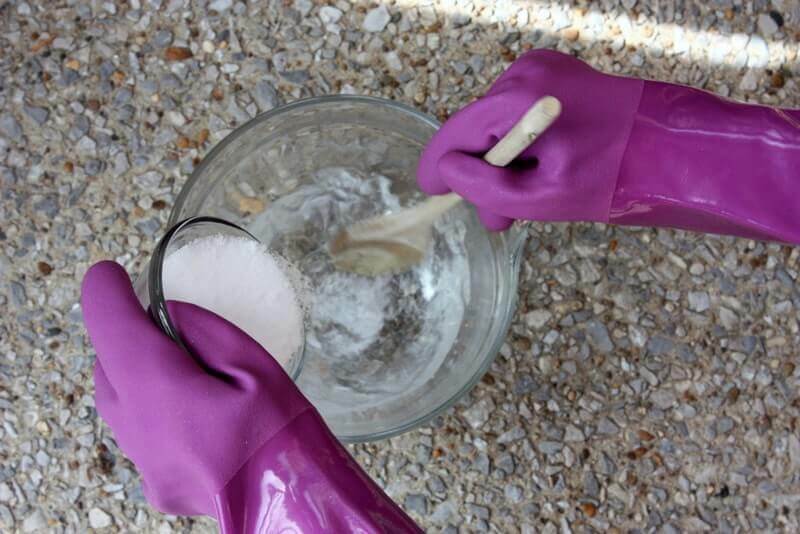 Step 2: Add water to a medium-sized glass or ceramic bowl and take it outside along with the lye and long-handled spoon. While wearing your protective gear and taking care not to breathe the vapors, slowly add the lye to the water while mixing gently. Order is important here, so make sure it is the lye you’re pouring into the water. The mixture will get very hot so be careful! Let it transition from cloudy to clear, then bring it inside. Let cool for 5-10 minutes while you work on step 3. 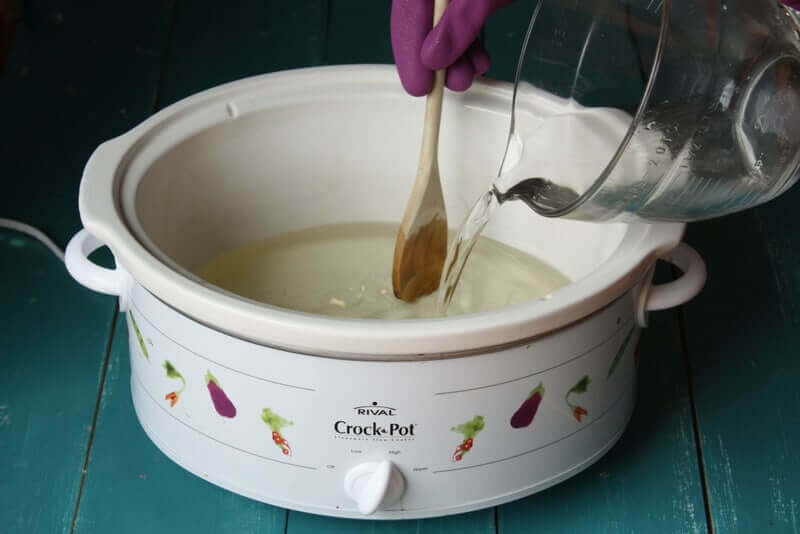 Step 4: Place coconut oil in your crockpot and set to low. 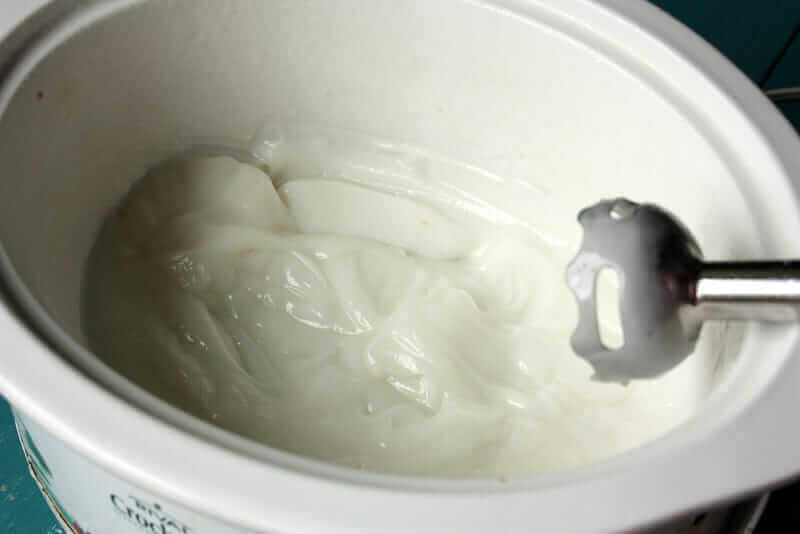 Step 5: Add lye to crockpot (being careful not to splash) and stir a few times. Step 6: Using the stick blender begin mixing toward “trace.” You’ll know trace is achieved when the mixture has the texture and thickness of a light pudding. Step 7: Cover and let cook on low. During this process the oils should rise up the sides like a wave and then fold back into the mixture. 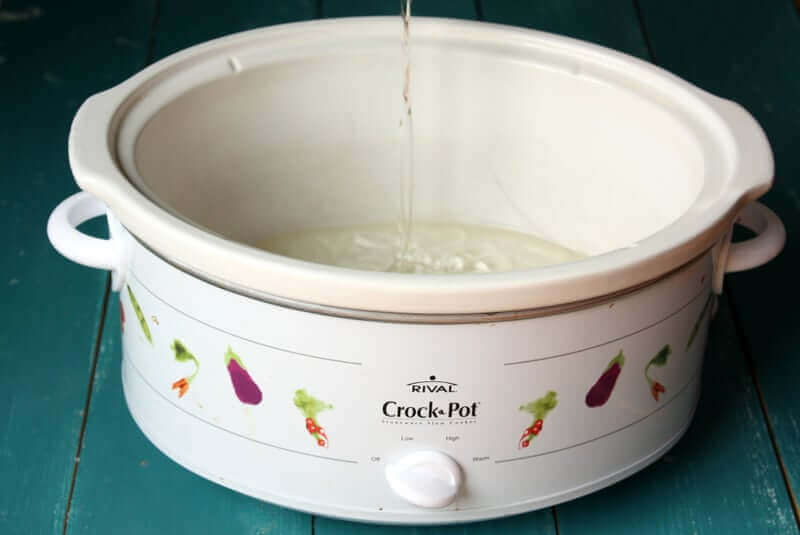 Mine usually takes 45 minutes – 1 hour but the cooking time will vary depending on how hot your crock pot is. Check on it often. If it rises up the sides and seems like it might overflow just give it a quick stir and it will reduce in volume. Step 8: When the soap is ready it should look a little like semi-translucent vaseline with no oil puddles in the middle. There are two ways to test and see if it’s done. First, dip a PH test strip and wait several minutes for it to fully change color. It should be between 7-10. If it is higher than 10 it’s not done. For a slightly less scientific approach, take a little of the soap and rub it between your fingers. It should feel a bit waxy. Now touch it to your tongue. If it ‘zaps’ you, it’s not done. 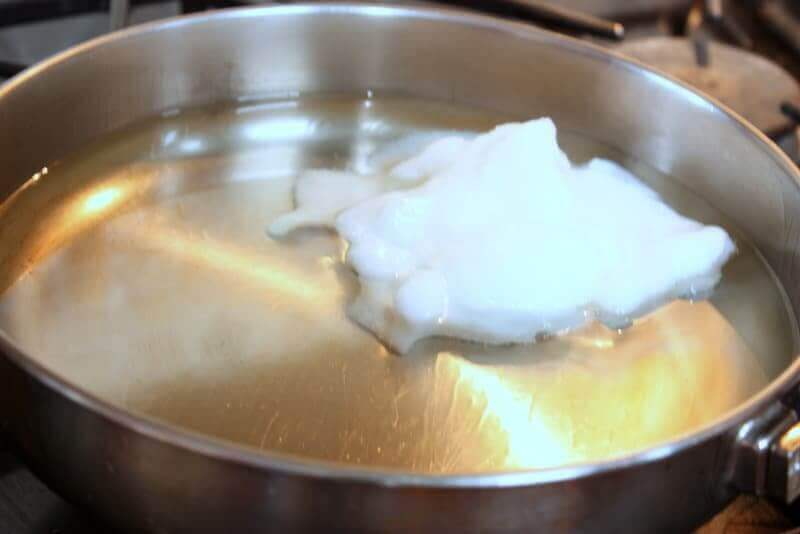 Note: It is really important to make sure all the lye is converted – otherwise the finished soap can burn! Step 11: Unlike other bars which need to harden for 24 hours before being cut, coconut oil makes a very hard bar that will be difficult to cut if you let it dry too long. Cut as soon as it’s cool and firm. Step 12: In an area with good air flow, place bars on a rack/tray with about an inch of space between them. Allow them to dry out and harden for another few days. Though you can try your first bar right away, it’s best to let them sit for 2-3 weeks to let the conditioning properties fully develop. About 1 year when stored in a cool, dry place. Disclaimer: Sodium Hydroxide is highly caustic and should be handled carefully and knowledgeably. 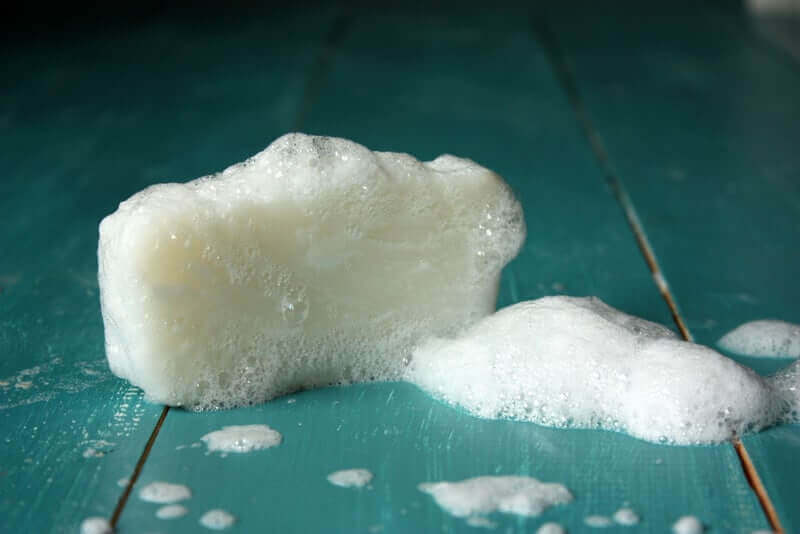 It is the soap makers responsibility to research safety procedures for soap making.